In this unit you will learn two notes on the fourth string, ornaments and the tie. ‘E’ is on the first space of the staff. To play ‘E’, fret the second fret on the fourth string. ‘F’ is in the first space of the staff. To play ‘F’, fret the third fret on the fourth string. Ornaments typically embellish melody. However, ornaments can embellish harmony as well. Notice that many of the ornaments described below demand consideration of both pitch and rhythmic duration. 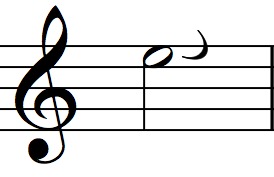 The acciaccatura is a note grouping in which a grace note with a line through the stem ties to a principal note. 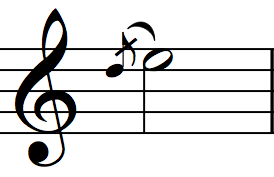 The grace note is played slightly before the downbeat of the principal note. The bend is usually notated as upward curving line, sometimes with an arrow on the end. This symbol leaves the exact pitch of the bent note up to the performer. It can also be notated as two conjoining diagonal lines. 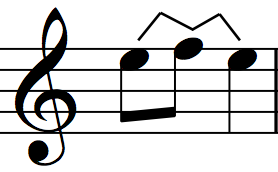 This symbol specifies the exact pitch of the bent note. The bend directs you to either push the vibrating string toward the ceiling or pull it toward the floor. Both actions raise the pitch of the vibrating string. The bend and release is usually notated as upward and downward curving line. It can also be notated as three conjoining diagonal lines. It directs you to pluck, bend and return the string to its starting pitch. 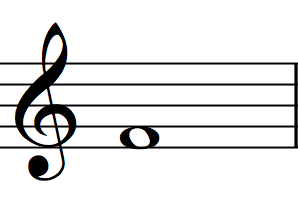 The glissando is commonly written as either a wavy or straight diagonal line connecting two notes. 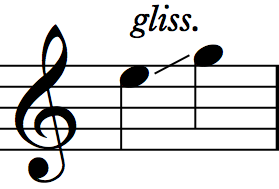 Sometimes the abbreviation ‘gliss.’ for glissando sits atop of the line. 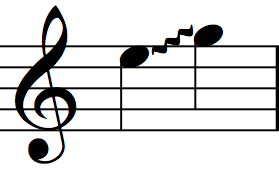 The glissando is a continuous slide from the starting to ending note. The slide (AKA portamento) is commonly written as a diagonal line. Sometimes the abbreviation “sl.” for slide or “port.” for portamento sits atop the line. 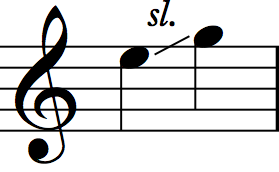 Slides can connect two specified notes with a continuous motion, in the manner of a glissando. Yet, sometimes only one note is specified and the performer can determine the other note. Typically, the performer can choose the rhythmic nuance of a slide as well. 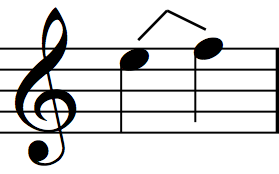 The appoggiatura is a note grouping in which a grace note (the note in small font) ties to a principal note. 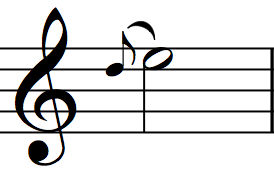 The grace note is played on the downbeat of the principal note and takes approximately half its rhythmic value. The tie is a curved line that connects notes of the same staff position and name. Tied notes sustain for the sum of their rhythmic values. 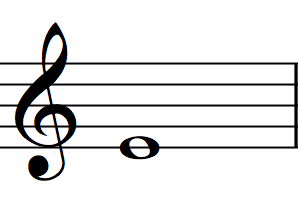 Usually, the tie connects two notes across a barline. For guitarists, the tie directs us to initiate the sound by plucking only the first of the two notes and allow the second of the two notes to sustain for its stated duration. In other words, we only pluck once, not twice. The tie may look like the slur but they function in dramatically different ways. The tie alters rhythm whereas the slur alters articulation. To tell them apart, remember the following: the tie connects two notes of the same pitch whereas the slur connects notes of different pitches. Embrace the unexpected. Sometimes the most innovative sounds and meaningful insights arise during sight-reading. You only get one chance to have a first musical encounter with a piece. Open yourself up to the possibility of an inspiring first impression.